Natalia. My beautiful darling. The little girl that captured my heart. The precious girl I dreamed for years would be my sister. Yet it appears that dream must die. Instead of just sitting around feeling depressed and sad about her situation, I've decided to do something about it. I want to find Natalia a loving family. I need your help. Do you know someone looking to adopt? Are you able to donate money to her grant fund so a family can afford to get to her...and fast? Do you have a blog and/or Facebook where you can post her picture and a link to her profile? Could she be your future daughter? Natalia is a GORGEOUS little girl with brown hair and giant blue eyes. She is 6 years old. She is a very smart little girl, but her medical records show cognitive delay and some epileptic issues. Her seizures are infrequent, and she does take medication to control it. Her cognitive delay is likely a result of the seizures though. 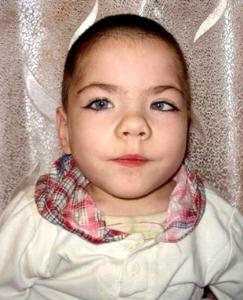 She also has some strabismus (crossed/lazy eye), but this can be corrected in the US. Natalia is able to speak, and when our missionary asked her if she would tell us something , she was trying to rehearse a little poem! Natalia is not able to walk on her own. She is carried everywhere. We are uncertain as to WHY this is, but can only know in our hearts that her life will be greatly improved to have therapy and a family of her own. She is a very nice little girl, happy and friendly and beautiful. She will truly thrive in a family environment. Natalia is already living in an institution, so we need a family for her right away! She recently lost her adoptive family, so her situation is urgent! She is STILL living at the "not so good" place, and is unable to walk on her own yet. We need to get her out immediately. As with all children living in these difficult conditions, this child's cognitive development has regressed significantly since he/she was younger. It is of crucial importance that any family considering the adoption of an older child from the mental institution setting be well prepared for what to expect with regards to how the neglect and lack of adequate medical care and nourishment has affected this child. These children all have TREMENDOUS potential for improvement, and deserve to have a life outside these four walls. These children are truly living on borrowed time, and families should be home study approved before an official commitment can be made for this child. $144.00 is available towards the cost of my adoption! The thought of my sweet girl languishing in a heartless institution is almost more than I can bear. For those who don't know about institutions in Eastern Europe...they lock these kids up, leave them to lie on beds for days and weeks and months and years with nothing to do, and wait for them to die. There is no future for them if they are not adopted. They are not loved or cared for. Even basic physical needs are often neglected. They shave their heads so lice won't spread. The conditions are much worse than I can paint in words. I hope and pray that someone will start the journey to rescue her-and the many others who wait-soon. Will you join me in fighting for Natalia? Thank you so much for sharing this with me, Mrs. G!!! I am filled with so much joy right now and I am thanking God! Please, feel free to contact me if you need help with anything and I'll see what I can do! (i.e. if you host a fund-raiser, etc.) Is there a way I can stay in touch with you? I hope so. I am "Alyssa Liljequist" on Facebook. I can't thank you enough for starting out on this journey in faith to bring Natalia into your family! I would like to share the happy news in a new blog post. May I? Or should I wait? I would also love to include a link to your blog or FB, if you would like. UPDATE: Due to unforeseen circumstances, the G family will not be able to adopt Natalia :(. She is still in need of a family!! !